Highlight® isn't just a pretty tool - our technology is backed by hard data. When lives are on the line, we take the science seriously. Learn more about Highlight® through peer-reviewed research and literature below. Evaluation of novel chemical additive that colorizes chlorine-based disinfectants to improve visualization of surface coverage. Mustapha A, Cadnum JL, Alhmidi H, Donskey CJ. Am J Infect Control. 2018;46(1):119-121. "Our results suggest that addition of Highlight® to chlorine-based disinfectants could increase the ability of personnel to identify sites of application for up to 3 minutes without adversely affecting efficacy against pathogens. Highlight® could be useful during environment cleaning training sessions or potentially as a routine additive for all manual cleaning with chlorine-based disinfectants." Percentage of sites correctly identified by personnel as having or not having bleach application when testing occurred within 30 seconds of application, stratified based on whether Highlight® solution was added to colorize the bleach solution. Field-testing of a novel color indicator added to chlorine solutions used for decontamination of surfaces in Ebola Treatment Units. Kang J, Tyan KS, Jin K, Kyle AM. J Hosp Infect. 2018;99:188-191. "Disinfection with chlorine solution was used in West Africa to prevent transmission of Ebola virus disease. This study surveyed 94 healthcare personnel and community leaders in Liberia and Guinea to assess understanding of disinfection and evaluate feedback on the perceived usefulness of Highlight®, a new color indicator designed to improve chlorine disinfection procedures. Using a Likert-type scale questionnaire, respondents agreed or strongly agreed (p < 0.0001) that Highlight® improved coverage of chlorine solution and feelings of confidence. Healthcare personnel conduct spray decontamination doffing procedures with chlorine solution alone (left) and with Highlight®-enhanced chlorine solution (right) in Conakry, Guinea. Novel color additive for chlorine disinfectants corrects deficiencies in spray surface coverage and wet-contact time and checks for correct chlorine concentration. Tyan KS, Kang J, Jin K, Kyle AM. Am J Infect Control. 2018;46:624-627. "Highlight® not only improved spray surface coverage to >99.9% but also maintained coverage for over 15 minutes due to formula agents that uniformly spread the solution and inhibit evaporation. Highlight® ensures bleach usage in accordance with label claims by fully covering surfaces for the appropriate contact time...We demonstrated that the fading time of Highlight® directly depends on the concentration of chlorine to which it is added. Therefore, an unexpected fading time indicates that the bleach was prepared at an incorrect concentration, even if the error is small." Percentage of surface area covered by CONTROL (bleach alone) versus HLT (bleach with Highlight®) solutions when sprayed on Tychem QC and left for 15 minutes. Error bars show standard error. Error bars for all HLT data points are too small to represent on the graph. Tests were performed in triplicate. Representative images of CONTROL versus HLT sprayed on surfaces at 0, 7, and 15 minutes are shown to the right, with corresponding surface area coverage values. The images of 0, 7, and 15 minutes were chosen to show the surface coverage appearance at the beginning, midpoint, and endpoint of the tests. Evaluation of the antimicrobial efficacy and skin safety of a novel color additive in combination with chlorine disinfectants. Tyan K, Kang J, Jin K, Kyle AM. Am J Infect Control. 2018;46:1254-1261. "Efficacy testing performed by an independent GLP-compliant laboratory confirmed across a variety of test methods and pathogens that the addition of the color additive did not adversely affect the antimicrobial efficacy of 3 major chlorine disinfectants. In these studies, chlorine disinfectants with [Highlight®] achieved the same level of disinfection as the chlorine disinfectants alone and passed different efficacy criteria established by EPA and ASTM guidelines." 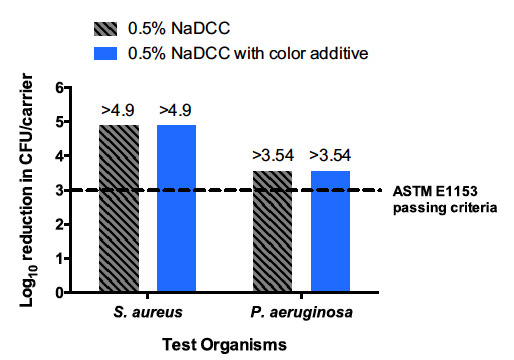 Efficacy of 0.5% NaDCC with and without color additive after 5 minutes ± 5 seconds contact time against S. aureus and P. aeruginosa. The ASTM E1153 passing criterion of 3 log10 reduction is represented by the dashed line. Novel colour additive for bleach disinfectant wipes reduces corrosive damage on stainless steel. Tyan K, Jin K, Kang J. J Hosp Infect. 2018. In press. "Based on ASTM guidelines, the corrosion rates caused by both bleach wipes alone are considered excessively high (> 5 mpy) whereas the use of Highlight® reduced the corrosion rates to levels considered negligible to mild (< 2 mpy). These results demonstrate that Highlight® improves the materials compatibility of bleach wipes by reducing their propensity to discolor and corrode stainless steel." Visual appearance of stainless steel 316L coupons before and after 120 bleach wipe treatments. Procedural control coupons were untreated. Three trials were performed for each group, with each trial (1, 2, 3) corresponding to a single coupon treated 120 times by a type of wipe. A novel color additive for bleach wipes indicates surface coverage and contact time to improve thoroughness of cleaning. Tyan K, Jin K, Kang J. Infect Control Hosp Epidemiol. 2018. In press. "Based on manufacturer recommendations and institutional guidelines, the relative light unit (RLU) benchmarks used to assess thoroughness of cleaning were pass (≤50 RLU) and fail (>50 RLU). Cleaning with bleach wipes alone yielded a failure rate of 5.70% (54 of 947 samples) with an average RLU value (mean±SD) of 18±137, whereas the introduction of Highlight with bleach wipes resulted in no failures (0 of 73 samples) with an average RLU value of 14±10."